No smell of disinfectant in the ward but a light scent of perfume. By this we can know that she is a pretty woman. Her name is Elie. She was sitting in the bed and surprised when seeing us. She slightly dressed herself and sat in a position right for conversation. She looked younger than her real age. Instead of patient clothes, she was in a skirt of flowers and a simple but elegant scarf, with proper makeup, she made me feel like I’m visiting an old friend who hasn’t seen for long, but not an interview. In front of our camera, she did not feel nervous at all, but only cared that if she can talk freely. She said: “My treatment plays good, now I feel I’m stronger. Thank God, thank Modern Cancer Hospital Guangzhou.” She laughed out later and her excitement was so easy to note. She should be the kind of woman that likes laugh and her smile was amiable and agreeable which can affect everyone around. Only through her words can we know she is a breast cancer patient undertaking treatment in hospital. She mentioned that, 4 years ago, occasionally, a bean-size tumor was found in her right breast. She did not mind it until that tumor increased to an egg-side, her skin developed to peau d'orange, even pain and fever occurred that she became scared. She went to a hospital where her friend worked in for biopsy. The report shocked her greatly: invasive ductal carcinoma of left breast. Doctor told her that she can survive at most 3-5 years more. Taking this bad news, she cried sadly. After knowing this, her friend comforted her and suggested her to take treatment aboard. By this friend, she was told that Modern Cancer Hospital Guangzhou in China may help her, as many patients are well treated there and some are even recovered. 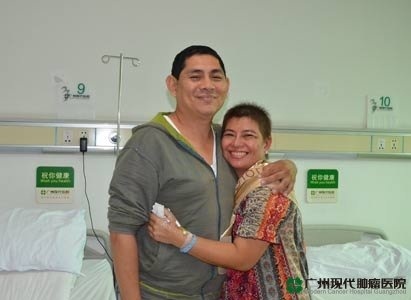 Elie came to Modern Cancer Hospital Guangzhou under the company of her husband. The biopsy she took in Modern Cancer Hospital Guangzhou indicated: invasive ductal carcinoma with metastases to lymph nodes in left armpit. Doctor explained to her that she should take radical operation of breast cancer. She knew it not only is the suggestion from doctor, as well as is the best choice for her. She hesitated for the pain in operation. However, as a type of strong and positive, she decided to have operation, with a belief that cancer can never get over her, but only she can come over herself. After a cycle of adjuvant chemotherapy, the tumor in Elie’s left breast shrank obviously. As planned, she received the radical operation on Dec. 4, 2012, which was not that tough and painful as expected. She was happy about her choice. On Feb. 2013, Elie returned to hospital for follow-up and she was pleased about the result. Under doctor’s suggestion, she also had had natural therapy to improve her immunity, so her body can come back to health faster. She said she is so lucky though, in Modern Cancer Hospital Guangzhou, there are the best medical devices, best doctors and best medicines. She felt better each time seeing the smile of medical people, not only physically, but also emotionally. She wanted to thank God and the medical staff for helping her and gaining back her life. What made her feel more fortunate than others is her husband, a man who loves her so much. The husband cared her specifically from her emotions, minds and body. She said, he is not the man good at expression, but he is willing to give her the greatest and selfless love. Elie added she will come back to hospital for treatment regularly in coming 5 years. Because only when she conquers her cancer completely can have more time for the things she wants to do, like coming back to the life she used to had, her business, or helping more poor families….then the life won’t be lonely but fruitful.